For more than 40 years, Columbia Builders, Inc. has mastered blending artful designs, superior craftsmanship, and state of the art energy efficiency, in every home we build. We strive to build custom homes of enduring quality, and relationships that last long after move-in day. Whether you’d like us to build for you at a currently available location or you wish to build a custom home on your lot, we work hard to ensure that your new home exceeds all of your expectations. Featuring outstanding energy efficiency, quality materials, and a wide variety of amenities, our custom home designs are a cut above the rest. For a truly one-of-a-kind home, we will work closely with you to design a home that’s uniquely your own. Give us a call today at 410-730-0215 to find out how we can create the home of your dreams! Explore our currently available locations throughout Howard County. Learn more about where we build our exceptional new homes. 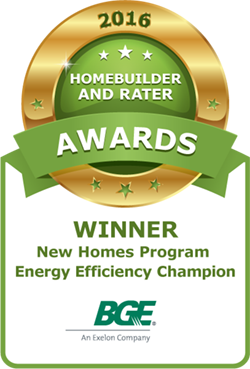 Your new home will be beautiful as well as energy efficient. Learn more about how we go above and beyond to make your home as efficient as possible. We offer a portfolio of home plans that you may customize or you may custom build an original design to suit your style as well as your needs. Learn more about our home designs.